Gone are the days of having to wait to deal with snooty invitation stores. There are so many great online stores that sell invitations for second weddings and vow renewals. While there are hundreds of options, at Team Wedding we have our favorites so decided to share them with you. These online wedding invitation stores are each unique in their own way and most offer 24 hour shipping on most orders. Customizable full color wedding invitations, announcements, and invites of all sizes, there is plenty of choice and great quality invitations. Personalize and preview your second wedding invitations and vow renewal invitations. Similar to first wedding invitations, your second wedding invitations would also reflect the hosts of the event. 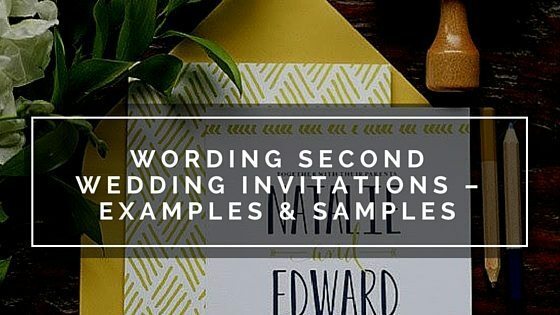 Below you’ll find some sample wedding invitation wording along with some of the top questions about sending, wording and addressing these special invites. If you have a question that isn’t answered here, please Ultimate Guide to Wedding Invitations to ask our wedding etiquette experts. With the many different family situations these days, it stands to reason the etiquette for wording invitations when parents are involved can get very complicated. Hosting typically means paying. There are many ways to word a wedding invitation when the bride and groom are hosting. Following are examples of the most common wording. Note the use of more formal wording (honour of your presence) when the wedding takes place at a church or house of worship. Notice that the formal wording has all of the dates and time spelled out. What Makes an Engagement Ring for Second Marriages Better?